We got a new 40″ Sony Bravia Flat Panel LCD HD TV! We bought it at Best Buy, and it was an open box, returned item but still brand new and nothing wrong with it. Which actually worked out to our favor since my Corolla probably would not fit the TV with the box. 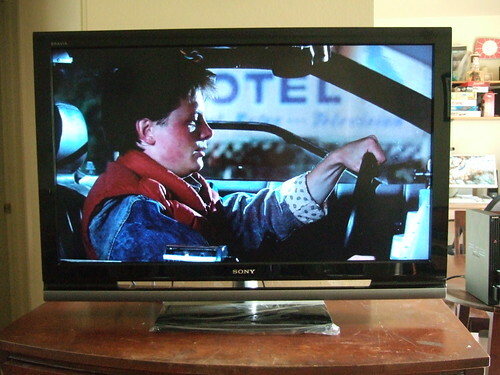 First movie I watched on it was Back to the Future! It looks great and its sooo big. We had to reconfigure all of our DVR recordings to be the HD versions wherever possible. Most all our shows are available in HD so that is awesome. Finally we are taking advantage of our HD service from Comcast.